Local MP John Healey says any plans to form an NHS subsidiary company at Rotherham Hospital should be halted. Last month, NHS Improvement, the national regulator, ordered a temporary stop asking trusts to "pause any current plans to create new subsidiaries or change existing subsidiaries" adding that it will consult on a new regulatory approach in October and issue new guidance. 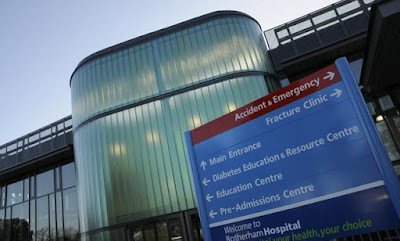 John Healey, MP for Wentworth and Dearne, said: "The Rotherham hospital board must now set aside any plans it has for setting up an NHS subsidiary company. Since the idea was first floated, I've voiced my concerns directly with the chairman and chief executive. It would create a two-tier workforce and smacks of a dodge to avoid paying VAT. So I welcome the NHS nationally calling a halt on these local hospital companies. "It's a sign of just how stretched NHS finances have become that hospitals are reaching for ever more complicated schemes to try to save money." In May, The Rotherham NHS Foundation Trust, awarded a £192,000 contract to consultants, Grant Thornton for support in setting up a Wholly Owned Subsidiary Business of the Trust. The tender documents stated: "We require a provider who has experience, preferably of working with NHS Foundation Trusts, in setting up subsidiary companies to create alternative vehicles for service delivery across a number of existing Trust services. We expect the provider to support in a project management capacity bringing knowledge and experience of similar situations to help ensure we are able to make a successful transition of services to the Wholly Owned Subsidiary meeting all legal, regulatory, financial and sound governance principles and requirements." It is thought that the services being considered as part of the subsidiary discussions were essential core areas such as porters and domestic staff. Over the summer, local unions submitted a petition signed by 1,438 individuals expressing their opposition to the establishment of a wholly owned subsidiary by the Trust. The original plan for the budget in 2017/18 had been a deficit of £13.6m, which was reforecast with the Regulator in January 2018 to a deficit of £22.3m. The Trust has set a financial year end deficit for 2018/19 of £20.3m.